We are not moving far, I would say about 5 blocks away from where we live now. When you walk the streets of most of centre-ville in Lyon, pretty grey stone Haussmann style buildings that are relatively new to the architectural cityscape line the avenues, each building featuring its own signature details, sculptural elements at the main doorways, big varnished wooden doors with brass knobs, and mosaic tiled hallways with marble staircases. This sumptuous entry and housing style is what the French call "Grand Standing". The apartments in these buildings, which originally took one entire or even several floors of a building, were built as dwellings from the beginning and have been slowly transformed and divided over about 120 years and generations into the apartments we know now. Our building is one of the many of this sort on the frontier of a sort of bourgeois enclave, the Martiniere neighborhood. There's a little footpath of an alleyway that communicates the Halle de la Martiniere to Place Sathonay, and there you step out onto cobblestone, and look up and begin to see a remarkable shift in building style, to a different type of architecture that has a very interesting and colorful story. These buildings, much more modest in structure and finishing, were created as workshops in Lyon's silk production. Single exterior doors open into tight hallways, tunnels, and interesting labyrinth type passages and stairwells that cut through and make footpath shortcuts between the winding roads that climb this hill. These are called traboules, and there are hundreds to tell you about. But back to the buildings: These workshops were not finished with plasterwork, moulding, and wood paneling, but followed their function with enormous bare beams that floated above cavernous spaces holding the enormous looms employed in the weaving of Lyon's world renowned silk. The whole mass of this district was built rather quickly in the mid 1800s, in a grand re-organization of Lyon's silk industry by Napoleon III, with the goal of consolidating production into one area of the city, since it was previously scattered between various districts: The docks just south of Vieux Lyon, warehouses in the 8th arrondissement, and trading and shipping consignment houses located on the presqu'ile. These workshops were built over this hill that in pre-revolutionary days had been church owned gardens, orchards and vineyards. This is from a finished apartment we looked at one street over (too expensive). Our ceilings will be lower but feature this kind of wood and stone. When we started looking at property on the Croix Rousse hill, the exposed ceiling beams and the warm stone became the predominant architectural detail that gave the spaces their flavor. Since the ceilings of the majority of these workshops were originally built high enough to accommodate the loom works, the thing you notice immediately in the renovated spaces we were looking at were their sweeping volumes and warehouse-like loft style spaces. This is a very seductive but also troubling aspect of the architecture here, if you have ever tried to furnish a room with 20 foot ceilings on a budget. While the space seems enormous which can sometimes seem cold, at the same time, the earth and wood elements bring at the same time a unique and architecturally indigenous warmth that achieves a balance. We looked at a handful of apartments that had been previously renovated, some very well done, others DIY projects gone awry when people built shoddy looking platforms with cheap stained plywood (think frathouse) and called them "lofts". They all had one thing in common: EXPENSIVE. The average price per square meter for the most polished places was way beyond our means for the floor space we needed. We comforted ourselves with the thought that they would cost a fortune to heat. The boulangerie has what is called a "floor and a half", meaning that we have the ground floor and an originally conceived second floor with lower ceiling heights, yet with their old beams and stone original to the structure.The boulanger tells us that it has "always been a boulangerie", but I am not sure about that. The notaire's job is to do the research on the history of the building, and we have a first appointment with him in a couple of weeks. When we first moved into our current apartment, I had problems with the ballroom-like ceiling height, feeling like all of our belongings had sunk to the bottom of a fish tank. You don't think about these things when you're falling in love with empty space and sweeping windows, and it takes some finesse to try and draw the gaze up from the floor with artwork and furniture arrangement to visually dwell in the whole space rather than just what's settled at the bottom. 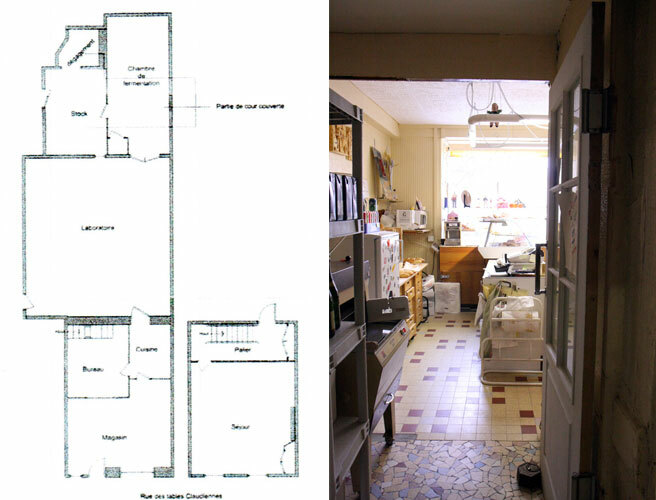 So that will be the first main difference in considering the organization of the space in the boulangerie. It is going to be much more down to earth in its volumes. I think this is a good thing, because the predominant warmth of the wood and stone elements are naturally adapted, in my opinion, to surrounding people in an intimate way. I don't think my comment yesterday made it through. I'm so pleased for the realization of your dream, and wish you MUCH happiness and success in all this new and life-changing endeavour. Will it be possible to preserve those wonderful signs---perhaps the big board one could be hung indoors in the cooking school? They're such a part of the bygones of the place and street, and would be such a memorable and enduring reminder of the rich history of your new home. Thank you Ali, and Rachel. Rachel, I don't know about the signs. I think they are taking them away although we have already negotiated for me to keep the pastry marble and another piece that will not be removed. The rest goes to another boulangerie. The sign at the top blocks light in the upstairs windows. I also don't know what will happen if I leave the signs there, since people might come in looking for bread! We'll make a decision as soon as we come to it, and also after learning the entire history of the place. What an adventure you have ahead!! And I can tell you love it already---with a different love, a belonging-to love which exceeds that for your present home which you've made so YOURS and which is always glad to see you. Somehow I mixed up the two posts, and said the same thing twice, which is par for me---blame it on the company I keep---a 3 1/2 year old, and at MY AGE! I'm looking forward to each and every step with you, and hope that all your own time constraints will still permit you to share all the wonderful new activities and accomplishments. I hope that the good wishes and encouragement from so far away will serve to buoy you even more as you work and prepare and arrange all the lovely elements of your new home. What lovely sentiments, thank you Rachel. It is wonderful to have you writing on your site again, thanks for taking the time to share your life and endeavours, as I am sure you are a very busy woman. settling your dreams into reality, isn't that what makes life so exciting? It will be SO interesting to watch the progression of your new place, thanks for sharing and keeping your readers inspired! As always, love your writing and beautiful photos. My partener and I are also starting out on a new business journey, thrilling and a little nerve racking, but oh so fun to follow your dreams!! Clotilde, but of course! The chambre de fermentation is hopefully going to become a studio, artists' studio that is. Thanks, Wendy for your support. Good luck in your new venture too. So excited for you- the new home sounds like an absolute dream. I'm with you on preferring smaller spaces to loftier ones. Invites a conversation and carries it in whispers if necessary. Can't wait to see what you do with it! Congratulations and good luck to you in following your dream. I have put your classes on my dream list. By the way, I made your Bonsoirs for my grandson and he loved them. I am searching for old tiles now. You're so right, this tktc, this place is going to be mucn more intimate. Alison, oh yes, please put them on your list. Thank you so much. I can't tell you how excited I am for you on all fronts. You are inspired and inspiring. "....this world was created by people who were brave enough to imagine the possibilities and make them happen" brava! Does the bakery have any other features from its former existence? Like a wood oven in the basement perhaps? We got home last night from our 10 days in Paris with but one side trip to Viron flour mill. (The trip was literally all about bread and chocolate.) So next time we come I'll make sure to put Lyon on the itinerary for a class and visit. And maybe another photography tour? Looking forward to more of your delicious reports. Priscilla, you know that might explain something about the shape of this little area at the very top of the diagram... I am going to have to do some digging to find out. Good luck on this great adventure. I love your blog and your photos. I love watching your project unfold and know that you will create another gorgeous home together! The windows to the kitchen are facing south on a square without anything to block the sun. Light is right!